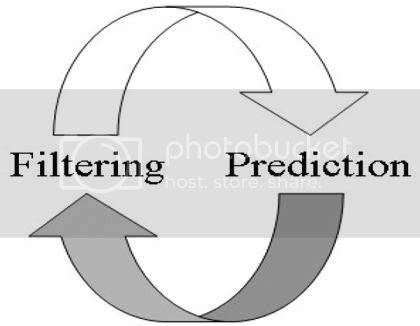 The kalman filter is a time series estimation algorithm that is mainly used combined with maximum likelihood approach to estimate parameters for given data. Compared with pure maximum likelihood, which typically assumes that the data series is observed without errors, and obtains the state variables by inversion, Kalman filter assumes that all data is observed with measurement errors, which is one of the big reasons why it becomes more and more popular in economics and finance, as many models in these fields depend on data that are either non-observable, for example, bond prices are observable but interest rates are not; energy future prices are easily observed but underlying assets are not, etc. ; or subject to noise, such as due to bid-ask spreads. Step 5: calculating the log-likelihood function under a certain distribution assumption and maximize the log-likelihood, usually a Gaussian distribution is applied. For a detailed Kalman filter example in excel, please read the paper "A simplified approach to understanding the kalman filter technique" for detail, I also wrote a sample tutorial file trying to mimic the results but failed, possible reasons are poor performance of solver in excel and the small simulated sample periods. Interested readers can choose to download a Kalman filter toolbox for Matlab. I am developing a model about gas consumption and I would like to use a VECM, but I would like to understand the difference between a pure VECM and the State Space Kalman Filter. The parameters at the first are fixed and at second one are not fixed, right? And Kalman Filter could be estimated using OLS?